A group of NPRE campers work through an activity on a computer. Exactly what is nuclear engineering? It has to do with power plants, right? On campus the week of June 25–29th for the first-ever Exploring NPRE camp, 18 high school students discovered that nuclear power is just one emphasis of NPRE (the Department of Nuclear, Plasma, and Radiological Engineering). 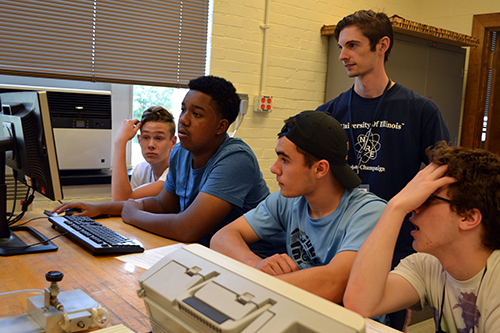 Plus, the rising juniors and seniors, mostly from the Chicagoland area, who attended NPRE’s week-long, residential camp not only learned about nuclear engineering, but plasma and radiological engineering as well, and how they impact our lives. Plus, they learned a bit about Illinois, and what it might be like to be an engineering student on campus. According to Becky Meline, Coordinator of Academic Programs for NPRE and also Coordinator of the new camp, high school students are commonly not exposed to nuclear engineering unless they're lucky enough to have a chemistry or a physics teacher who happens to touch on it. Thus, NPRE’s goal was to make students aware of what the department has available. An NPRE camper (right) interacts with NPRE grad student Nirbhav Chopra about the DC Glow Chamber during a tour of the Plasma Lab. She goes on to cite a few: plasma fusion science and engineering, which is a whole area of NPRE; radiological applications, with its disparate uses ranging from medicine to national security; as well as materials-related research related to power plasma fusion. According to Meline, the activities planned for the camp cut across all the different areas of the department. A camper works on his team's robot. Throughout the week, NPRE faculty and their research groups led sessions comprised of lectures, demonstrations, tours, and hands-on activities related to NPRE’s diverse research areas. For instance, in one session, campers built light detectors, or sensors, using Arduinos. One afternoon they were in one of the labs learning about radiation, shielding, and half-life. Another activity addressed nuclear medicine, such as the use of radioactive tracers, as well as radiology (X-rays), where the students also learned about different imaging modalities, such as PET and CT. Campers learned about plasma, how it affects our lives, and some of its applications. For example, one activity explored the ways plasma and radiation can modify material surfaces. Plus, with their finger on the pulse of what young people are interested in nowadays, the camp gave the high schoolers the chance to design and build their own personalized game, using Unity, a well-known game designing software. At the Plasma Lab, an NPRE student (left) gives the campers a close-up view of some of the materials they work with in the lab. But it wasn’t just all work and no play. Following the visit to the Clinton Power Station, the campers stopped by to visit another nearby attraction, Clinton Lake, for some well-deserved R&R. And to wrap up the weeks activities, on Saturday, when their parents came to pick them up, the students presented a PowerPoint with photos to give their parents a glimpse of all that they had learned and experienced throughout the week. Meline says NPRE's goal in doing the camp was mostly outreach—making students aware—along with maybe a little recruiting. “It'd be great to have students say that they want to apply not just to the College of Engineering, but to NPRE directly. But even if they don't, they leave with a more educated understanding of what the area is about, and that's a good thing as well,” she adds. Two campers work together to build their robot. A rising NPRE senior Zoe Richter (left) works with campers during a Radiation Lab activity. 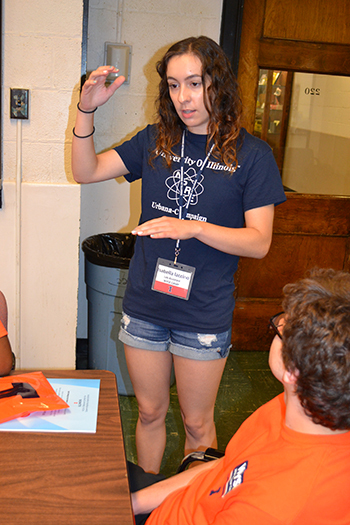 A rising junior in NPRE, Isabella Iaccino, explains an activity to the campers. 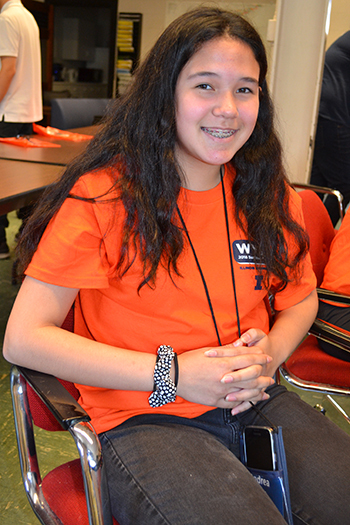 Iaccino, who really enjoys outreach, got involved with Explore NPRE because she wanted to help students discover what engineering is so they can make informed career decisions. She shares about her experience in high school. A rising sophomore who attended the NPRE camp, Andrea Grisalez. Brendan Walker works on his team's robot during an NPRE hands-on activity. 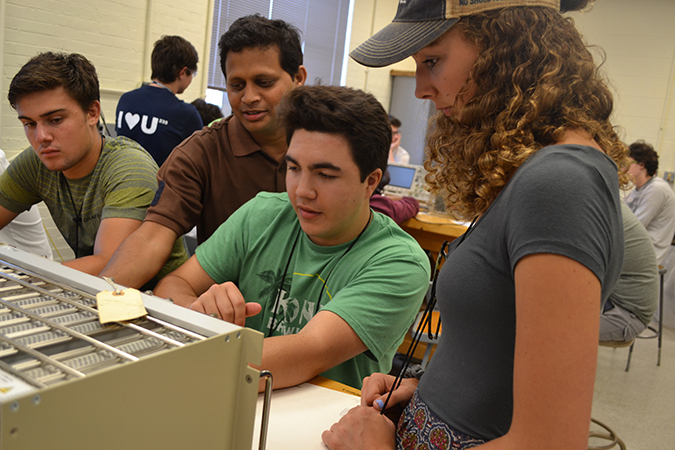 A group of NPRE campers work through an activity in NPRE's Radiation Lab.